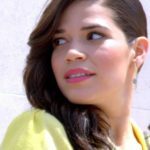 America Ferrera is an American actress. Born in Los Angeles, California, to Honduran parents, Ferrera developed an interest in acting at a young age performing in several stage productions at her school. She made her feature film debut in 2002 with the comedy drama Real Women Have Curves, winning praise for her performance. Ferrera is the recipient of numerous accolades including an Emmy Award, a Golden Globe Award, and a Screen Actors Guild Award among others. "As a child, I didn’t know what I didn’t have. I’m thankful for the challenges early on in my life because now I have a perspective on the world and kind of know what’s important." "I really hate the duties of being a celebrity, like getting dressed up for the red carpet." "I just wanted to see every single musical I could. The very first one I saw was ‘Beauty and the Beast,’ the only one I could get tickets for, and then ‘Les Miserables’ and then ‘Chicago.’"